I love your card candy!!! Everything goes together so well!!! Great Blog you have too!! The card candy looks awesome!! Great job onit and your blog...it's super!! Your Card Candy look Yummy and Pink! I love pink! 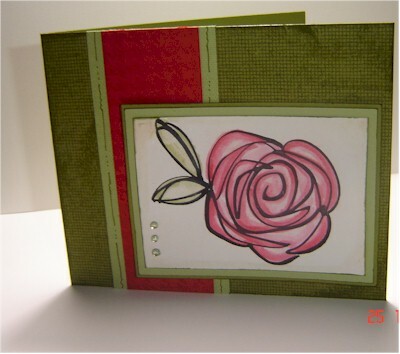 Happy Stampin! What a treat! Love the cupcakes! What a FUN idea! I can't remember how I found your blog, but now it's on my list to read everyday. Thanks for sharing your creativeness! I found your blog from SCS. I love your card candy. Great idea adding ribbon! Love your other cards too. Your card candy is adorable! I am in love with anything related to cupcakes. Please enter me in your draw. :-) I wasn't sure if I was supposed to comment on this post or the other one. Hi Kendra. I just found your blog and your work is beautiful. I'm going to add your blog as one of my "Blogs I Visit". I look forward to visiting your blog often. Keep up the great work. Very nice...so cute who wouldn't want to win your card candy!!! I must say what a great idea as a last club night. I am having a last club night myself just around the corner...too soon to make these myself but what a great idea for my other group. Thanks for sharing. Great blog ... found out about it on SCS! Oooo, an extra? Nifty! Just started checking out your blog - love it. Thanks for the ideas! That is so adorable. It's almost like a little trick or treat bag for us stampers. Great idea! Cute card candy...great idea and great blog. Glad I found it. I have you highlighted as my spotlight blog of the week if you are interested in checking it out. Thanks for the inspiration. Awesome Card Candy. I just found your blog and I love your creations. Thanks for sharing you fabulous talent. Your card candy is adorable!! I love your blog! We had a foot of snow yesterday here in Chicago and most of the kids had a snow day. My daughter is a teacher in one of the only school districts that DID have school!